We all remember those 8 a.m. aural skills classes in college - sight-reading, singing intervals, singing bass lines, spelling chords. But what kinds of aural skills experiences are we giving our students before college? How can we incorporate aural skill activities in our weekly studio lessons? I've been doing a little research on this and came across several helpful resources for fostering the development of aural skills in private lessons (and at home) with students of all ages. If you don't already include aural skill experiences in your teaching on a regular basis, I hope this inspires you as much as it has me! The Associated Board of the Royal Schools of Music (ABRSM) Aural Trainer app is an excellent resource for helping develop aural skills in your students. Based on the ABRSM exams (Grades 1-8), the app includes exercises for pulse and meter, echo patterns (singbacks), identifying musical differences, and critical music listening, and for more advanced levels, sight-singing, cadences, modulations, and chord identification. Here is a video example of a Grade 1 ABRSM exam, to give you an idea. Notice how many facets of musicianship are included! My students love the pulse and meter exercises - simply tap the steady beat on the screen along with the recording, then determine whether the example was in duple or triple meter. For echo patterns, the app actually records you singing the patterns back, then plays them back for you with the original piano melody so you can evaluate and assess your performance (using a smiley face rating system). The app is available for iPhone, iPod Touch, and iPad. The Lite version includes sample content from Grades 1 and 4. The full version (all content for Grades 1-8) is $7.99. The 2015 Piano Syllabus is a free digital resource from the Royal Conservatory of Music (RCM) Music Development Program featuring repertoire lists, technique, and musicianship skills (aural skills, sight-reading) by level (Preparatory A, Preparatory B, Levels 1-10). *Note: The RCM was founded in Canada in 1886. The Music Development Program (2013) (formerly the Carnegie Hall Royal Conservatory Achievement Program) is the US division. The content, exams, and assessment materials are the same. This has been an invaluable resource for me in planning programs of study for my students and ensuring the development of technique and musicianship skills that correspond with their playing level. Download a copy of the 2015 Piano Syllabus here. 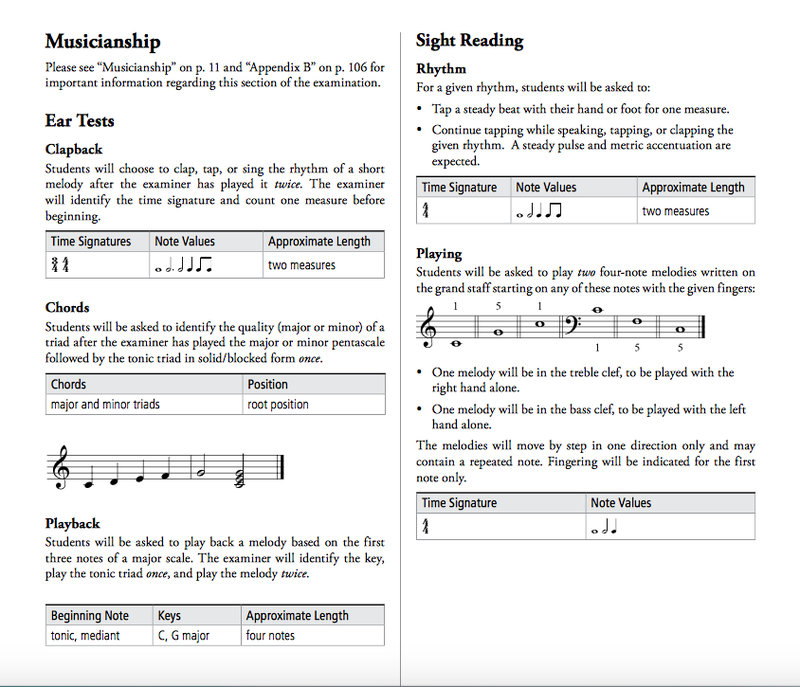 I have used the recommendations in the musicianship section (see Prep A, shown above) to write my own materials for student assessments during the year (playbacks, clapbacks, singbacks, and sight-reading). The best part is, I can reuse what I've come up with year after year as students move on to the next level. AURALBOOK is another helpful (free!) app for developing musicianship and aural skills. This app has versions that correspond with the ABRSM levels (iPhone/iPad) and RCM (Music Development Program) levels (beginning with Level 1) (iPhone/iPad/Android). It records playbacks, clapbacks, and singbacks, analyzes your performance, compares it with the original notation on the screen, and suggests areas for improvement. This graded series includes ear-training resources for pianists (student and professional), based on the RCM exams - perfect for daily home practice or studio use! Each level in the Comprehensive Ear Training series includes recorded practice sessions/mini exams on one or more CDs and a fully-notated answer booklet for checking your work. Content includes melody playbacks, rhythm clapbacks, interval and chord identification, and cadences (for advanced levels). They even include some helpful practice tips. Navigate through the Products menu to read more details and see and hear examples for each level. P.S. Carol Schlosar has similar resources for vocalists (Vocal Ear Training) and choral singers (Sight Singing Solution). Go take a look! E-Music Maestro offers a series of web-based aural training exercises correlated with the ABRSM and Trinity College exams. Content is similar to the ABRSM Aural Trainer app (see above) - pulse and meter, echo patterns (singbacks), musical differences, and critical listening. Perfect for in the studio or for students to work on at home during the week! Purchase access to E-Music Maestro content (monthly or prepaid) or try their free sample content. In case you haven't heard about this great teaching resource, allow me to introduce you. Teach Piano Today is an invaluable resource for piano teachers, with helpful tips, innovative materials, creative resources, and lots of practical advice for running a studio, planning, teaching, and inspiring your students. The Four Star Sight-Reading and Ear Test books work well with the Music Development Program in developing reading and aural skills and preparing well-rounded musicians. In addition to the daily sight-reading exercises in the books, however, Four Star also includes a supplemental online ear training portal for home or studio practice. The online ear training may be used in conjunction with the books or on its own. Use the code in your book to access the online content for free or purchase access separately. Prices start at $2.99 per level. Take a look at the free sample content on their site. Here is a sample exercise for Prep A, to give you an idea. Notice the interactive keyboard at the bottom of the screen, for reference during the exercise. This is a great resource for beginning students, as many of the resources mentioned in this post do not include content for Prep A and Prep B.
P.S. Watch this quick tutorial to see how to set up Four Star Online Ear Training on your computer. How to you foster aural skill development in your students? What are your favorite resources?